The unexpected hanging paradox, hangman paradox, unexpected exam paradox, surprise test paradox or prediction paradox is a paradox about a person's expectations about the timing of a future event (e.g. a prisoner's hanging, or a school test) which he is told will occur at an unexpected time. Despite significant academic interest, there is no consensus on its precise nature and consequently a final 'correct' resolution has not yet been established. One approach, offered by the logical school of thought, suggests that the problem arises in a self-contradictory self-referencing statement at the heart of the judge's sentence. Another approach, offered by the epistemological school of thought, suggests the unexpected hanging paradox is an example of an epistemic paradox because it turns on our concept of knowledge. Even though it is apparently simple, the paradox's underlying complexities have even led to it being called a "significant problem" for philosophy. A judge tells a condemned prisoner that he will be hanged at noon on one weekday in the following week but that the execution will be a surprise to the prisoner. He will not know the day of the hanging until the executioner knocks on his cell door at noon that day. Having reflected on his sentence, the prisoner draws the conclusion that he will escape from the hanging. His reasoning is in several parts. He begins by concluding that the "surprise hanging" can't be on Friday, as if he hasn't been hanged by Thursday, there is only one day left - and so it won't be a surprise if he's hanged on Friday. Since the judge's sentence stipulated that the hanging would be a surprise to him, he concludes it cannot occur on Friday. He then reasons that the surprise hanging cannot be on Thursday either, because Friday has already been eliminated and if he hasn't been hanged by Wednesday night, the hanging must occur on Thursday, making a Thursday hanging not a surprise either. By similar reasoning he concludes that the hanging can also not occur on Wednesday, Tuesday or Monday. Joyfully he retires to his cell confident that the hanging will not occur at all. The next week, the executioner knocks on the prisoner's door at noon on Wednesday — which, despite all the above, was an utter surprise to him. Everything the judge said came true. 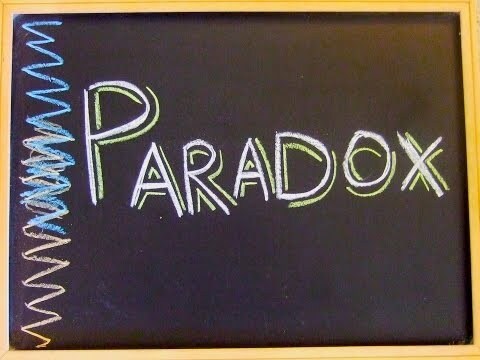 Other versions of the paradox replace the death sentence with a surprise fire drill, examination, pop quiz, or a lion behind a door. The informal nature of everyday language allows for multiple interpretations of the paradox. In the extreme case, a prisoner who is paranoid might feel certain in his knowledge that the executioner will arrive at noon on Monday, then certain that he will come on Tuesday and so forth, thus ensuring that every day he is not hanged really is a "surprise" to him, but that the day of his hanging he was indeed expecting to be hanged. But even without adding this element to the story, the vagueness of the account prohibits one from being objectively clear about which formalization truly captures its essence. There has been considerable debate between the logical school, which uses mathematical language, and the epistemological school, which employs concepts such as knowledge, belief and memory, over which formulation is correct. The argument that first excludes Friday, and then excludes the last remaining day of the week is an inductive one. The prisoner assumes that by Thursday he will know the hanging is due on Friday, but he does not know that before Thursday. By trying to carry an inductive argument backward in time based on a fact known only by Thursday the prisoner may be making an error. The conditional statement "If I reach Thursday afternoon alive then Friday will be the latest possible day for the hanging" does little to reassure the condemned man. The prisoner's argument in any case carries the seeds of its own destruction because if he is right, then he is wrong, and can be hanged any day including Friday. The counter-argument to this is that in order to claim that a statement will not be a surprise, it is not necessary to predict the truth or falsity of the statement at the time the claim is made, but only to show that such a prediction will become possible in the interim period. It is indeed true that the prisoner does not know on Monday that he will be hanged on Friday, nor that he will still be alive on Thursday. However, he does know on Monday, that if the hangman as it turns out knocks on his door on Friday, he will have already have expected that (and been alive to do so) since Thursday night - and thus, if the hanging occurs on Friday then it will certainly have ceased to be a surprise at some point in the interim period between Monday and Friday. The fact that it has not yet ceased to be a surprise at the moment the claim is made is not relevant. This works for the inductive case too. When the prisoner wakes up on any given day, on which the last possible hanging day is tomorrow, the prisoner will indeed not know for certain that he will survive to see tomorrow. However, he does know that if he does survive today, he will then know for certain that he must be hanged tomorrow, and thus by the time he is actually hanged tomorrow it will have ceased to be a surprise. This removes the leak from the argument. In other words, his reasoning is incorrect, as if the hanging was on Friday, he will have found it unexpected because he would have expected no hanging. It would be true even if the judge said: "You will unexpectedly be hanged today."